At Never Blue in Hendersonville, Executive Chef Jesse Roque and her husband and business partner, Edson, create a seasonally varied and notably creative small-plate menu to reflect their cultural backgrounds—hers a Southern upbringing and his Mexican. Amid the various Mexican-inflected dishes on their fall menu, which this year features wild game and even some underutilized cuts of meat (aka offal), is Roque’s unique take on butternut squash dumplings. The butternut squash lends earthiness and is balanced by spice from chipotle, a sweet crunch from smoky pecan pralines, and mild goat milk-flavored cotija cheese, which Roque says is an underappreciated Mexican cheese that can be found at specialty markets. She likes to garnish the dish with house-made duck prosciutto, which she sells by the pound at the restaurant. You can order the dish at Never Blue, or try Roque’s recipe at home. To prepare the butternut squash, heat oven to 375°F. 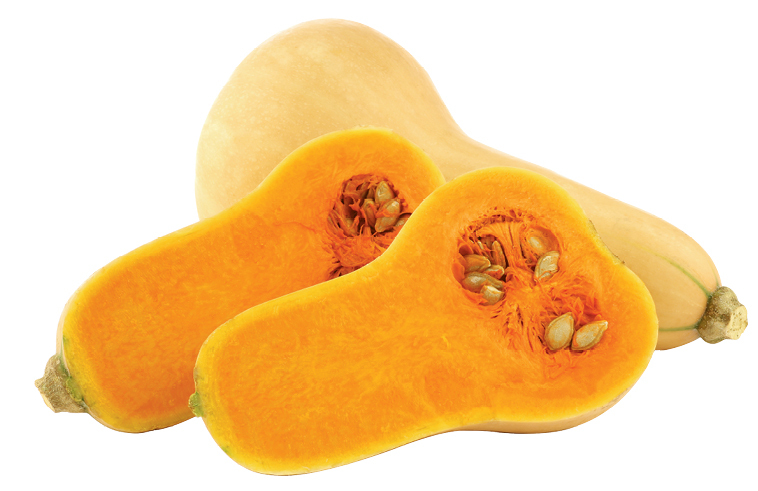 Cut squash into four quarters, scoop and discard seeds, and place face down in a shallow pan with a little water. Cover with foil and bake for 45 minutes to an hour, or until the flesh is soft and cooked through. Once cool, scoop flesh and mash. In a large bowl, mix together squash mash, butter, egg and yolk, and white pepper. Sift in baking powder and flour, and stir to combine until ingredients thicken into dough. Finish combining flour by kneading gently. Cover bowl and refrigerate for 20 minutes to let dough rest. Heat three inches of water in a large shallow pan to a light boil. Turn out dough onto a lightly floured surface and divide into four pieces. Roll out each piece to a quarter-inch thick and cut into one by one-inch squares. Drop squares into hot water and cook until they float (approximately one to two minutes). Remove with a slotted spoon to a greased sheet pan. Repeat with remaining three pieces of dough. In a large saucepan over medium-high heat, sauté butter and garlic until fragrant but not brown. Add heavy cream and bring to a boil. Reduce heat for two to three minutes, then add 10 ounces of cotija cheese. Simmer, stirring constantly until slightly thickened. Add dumplings and stir to coat. To serve, crumble remaining cheese over each plate and top with smoky pecan pralines and crispy duck prosciutto (optional).